There exist several different channel routing technologies in the field of optical communications. However, the evolution of single wavelength point-to-point transmission lines to wavelength division multiplexed optical networks has introduced a demand for wavelength selective optical add-drop multiplexers (OADM) to separate or route different wavelength channels. This article provides some fundamentals relevant to OADM. 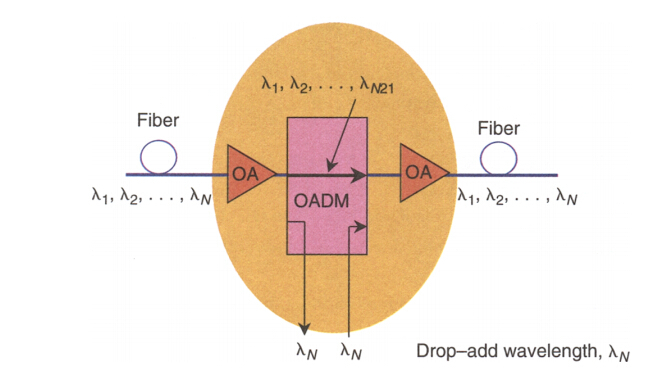 Optical add-drop multiplexer (OADM) is a device used in wavelength-division multiplexing (WDM) systems. “Add” and “drop” is a capability device to add one or more new wavelength channels to an existing multi-wavelength WDM signal or to drop, which means to remove one or more channels, passing those signals to another network path. OADM can be used at different points along the optical link to insert, remove or route selected channels thus to increase the network flexibility. OADM is particularly important in metropolitan WDM light wave services where offices or sited can be connected by different add-drop channels. A traditional OADM consists of three stages: an optical demultiplexer, an optical multiplexer, and between them a method of re-configuring the paths between the demultiplexer, the multiplexer and a set of ports for adding and dropping signals. The demultiplexer separates wavelengths in an input fiber onto ports. The reconfiguration can be achieved by a fiber patch panel or by optical switches which direct the wavelengths to the multiplexer or to drop ports. The multiplexer multiplexes the wavelength channels that are to continue on from demultiplexer ports with those from the add ports, onto a single output fiber. As we have mentioned above, the main function of an optical multiplexer is to couple two or more wavelengths into the same fiber. If place a demultiplexer and properly aligned it back to back with a multiplexer, there would exist two individual wavelength in the area between them. Then, this offers a chance for an enhanced function that individual wavelengths could be removed and inserted as well. The function would be called an optical wavelength drop and add demultiplexer/multiplexer—to make it briefly, optical add-drop multiplexer. The model of an OADM is clearly shown in the picture below, where F1 signifies a filter selecting wavelength λ1 while passing through all other wavelength, and M1 signifies a multiplexer that multiplexes all wavelengths. An even better view of OADM function is shown in the following picture. This function is often employed in WDM ring systems as well as in long-haul with drop-add features. There are two main types of OADM that can be used in WDM optical networks: fixed OADMs that are used to drop or add data signals on dedicated WDM channels, and re-configurable OADMs that have the ability to electronically alter the selected channel routing through the optical network. The fixed optical add-drop multiplexer (FOADM) is a traditional wavelength arrangement scheme that can only input or output a single wavelength via the fixed port. FOADMs have pre-assigned channels at static nodes and allowed adding and dropping of individual or multiple wavelength channels from a DWDM. The re-configurable optical add-drop multiplexer (ROADM), on the other hand, is a dynamic wavelength arrangement scheme, allows for dynamic wavelength arrangement scheme using a wavelength selective switch (WSS). The 8-dimensional cross-connect provided by the WSS enables quick service start-up, remote cross-connect and WDM mesh networking. The ROADM scheme can also achieve inputting/outputting a single wavelength or wavelength group via the fixed port. ROADM can add, block, pass or redirect modulated infrared (IR) and visible light beams of various wavelengths in a fiber optic network. Which featured by providing flexibility in rerouting optical streams, bypassing faulty connections, allowing minimal service disruption and the ability to adapt or upgrade the optical network to different WDM technologies. To summarize, OADM plays a vital role in improving and optimizing the network performance and reliability. And it is fully compatible with both local area network (LAN) as well as long haul networks. Moreover, OADM also serves as an essential device to meet the requirement of the rapidly developed network. This entry was posted in WDM Optical Network and tagged OADM, optical add-drop multiplexers, WDM on June 23, 2016 by Aria Zhu.